Amino acids are carboxylic acids that have an amino group. Depending on the location of the carboxyl group, they are divided into α, β, γ-amino acids, etc. In α-amino acids, the carboxyl group is located at the end of the carbon chain immediately after the carboxyl group. They are called α-amino acids because the amino group and the carboxyl group are separated by one carbon atom. All of the genetically determined proteins are made of α-amino acids. When a carboxyl group and an amino group are separated by two or more carbon atoms, the amino acids are called β-, γ-, etc. amino acids. 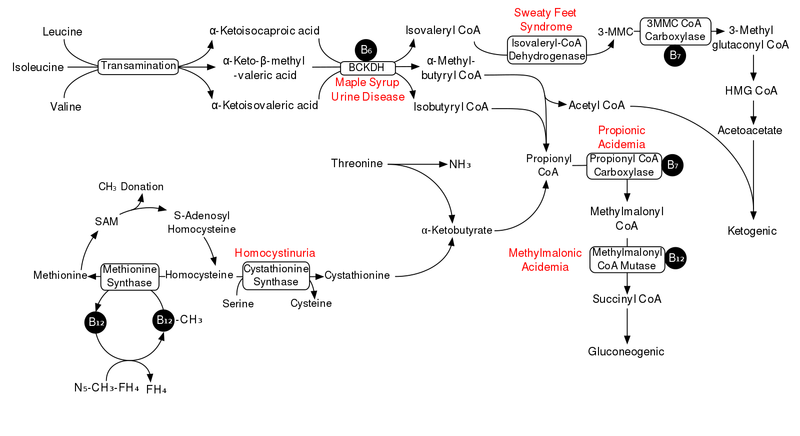 Amino acids with a hydrophobic residue – glycine, alanine, valine, leucine, isoleucine. Amino acids with one amine and two carboxyl groups (monoaminodicarboxylic amino acids) – aspartate, glutamate, etc. 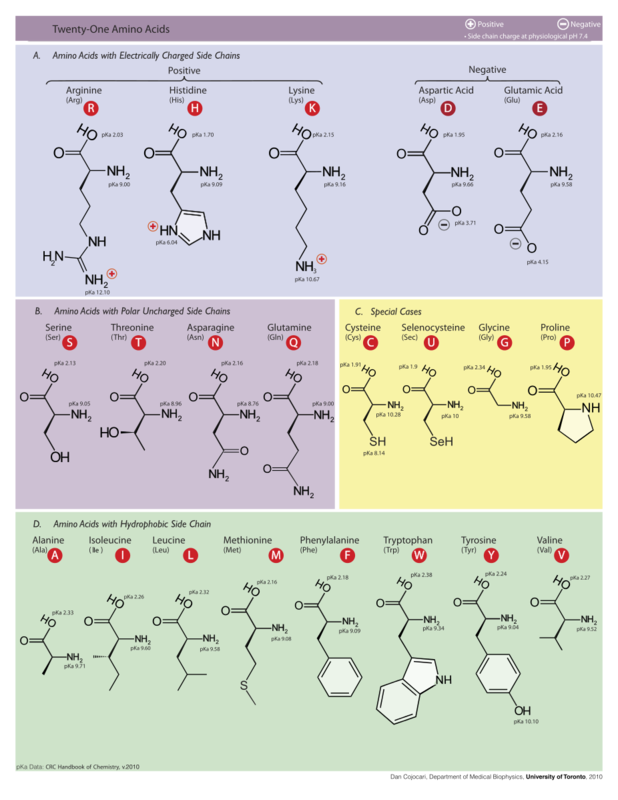 Amino acids with specific functional groups – serine, threonine, cysteine, methionine, lysine, arginine. Cyclic amino acids – phenylalanine, tyrosine, tryptophan, histidine, etc. There are a large number of amino acids, but only 20 of them (α – amino acids) are included in the protein composition. Other amino acids are involved in many of the functions of the human cell, but they are not part of the proteins. Most of the amino acids are metabolized in the liver, only three of the α – amino acids (leucine, isoleucine, and valine) are metabolized in the muscles. Amino acids react with each other to form peptide bonds. The peptide bond is formed between one carboxyl and one amino group belonging to two adjacent amino acids. The amino acids link via peptide bonds to form polypeptides and proteins. Essential amino acids – 8 amino acids, which cannot be synthesized in the human body, they have to come from food. All α-amino acids except glycine are chiral compounds and have two enantiomers: L- and D-form. Only the L-forms are biologically active. The different amino acids have different effects. Histidine has a vasodilating effect and lowers blood pressure, arginine stimulates the secretion of growth hormone from the pituitary gland, lysine is involved in the collagen production process, tryptophan facilitates the production of some vitamins, glutamine improves the brain function, glutathione acts as an antioxidant and has an immunostimulating effect, etc. Three of the essential α – amino acids have a branched chain. These are the amino acids leucine, isoleucine, and valine. They are called branched-chain amino acids (BCAA). The term “branched chain” derives from the nature of their structure that resembles lateral branches and is typical for these three amino acids. Unlike the other amino acids, BCAAs are metabolized in the muscles, and not in the liver. The BCAA are an important structural material for the muscles. They play an important role in the processes of building, restoring, and preventing the destruction of the muscles. While other essential amino acids are mainly used to build biologically active molecules (hormones, etc. ), BCAAs are the building blocks of the body tissues (muscles, organs). Leucine – regulates protein synthesis, improves brain activity, suppresses pain, prevents muscle breakdown and muscle loss. Branched-chain amino acids are one of the basic sports nutritional supplements. Isoleucine, leucine, and valine are used successfully by active sportsmen for restoring and increasing muscle mass. Increment in the effectiveness of sports nutrition. Amino Acids: Amino acids are carboxylic acids that have an amino group. BCAA: BCAA are essential α-amino acids with a branched chain. Amino Acids: Depending on the location of the carboxyl group, the amino acids are divided into α, β, γ, etc. The α-amino acids are subdivided into non-essential and essential amino acids. BCAA: The BCAA include the amino acids leucine, isoleucine, and valine. Amino Acids: Some amino acids can be synthesized in the body if needed, others cannot be synthesized and have to come from food. BCAA: BCAA cannot be synthesized in the human body, they have to come from food. Amino Acids: Most of the amino acids are metabolized in the liver, only three of the α – amino acids are metabolized in the muscles. BCAA: BCAA are metabolized in the muscles. Amino Acids: The different amino acids have different functions: histidine has a vasodilating effect and lowers blood pressure, arginine stimulates the secretion of growth hormone from the pituitary gland, lysine is involved in the collagen production process, tryptophan facilitates the production of some vitamins, glutamine improves the brain function, glutathione acts as an antioxidant and has an immunostimulating effect, etc. BCAA: The BCAA play an important role in the processes of building, restoring, and preventing the destruction of the muscles. Valine stimulates the growth and recovery of the muscles, isoleucine regulates the blood sugar levels, leucine regulates protein synthesis, suppresses pain, prevents muscle breakdown and loss, etc. Amino acids are carboxylic acids that have an amino group. BCAA are essential α-amino acids with a branched chain. Depending on the location of the carboxyl group, the amino acids are divided into α, β, γ, etc. The α-amino acids are subdivided into non-essential and essential amino acids. The BCAA include the amino acids leucine, isoleucine, and valine. Some amino acids can be synthesized in the body if needed, others cannot be synthesized and have to come from food. BCAA have to come from food. Most of the amino acids are metabolized in the liver, only the BCAA are metabolized in the muscles. The different amino acids have different functions: histidine has a vasodilating effect and lowers the blood pressure, arginine stimulates the secretion of growth hormone from the pituitary gland, lysine is involved in the collagen production process, tryptophan facilitates the production of some vitamins, glutamine improves the brain function, glutathione acts as an antioxidant and has an immunostimulating effect, etc. The BCAA play an important role in the processes of building, restoring, and preventing the destruction of the muscles. Dr. Mariam Bozhilova Forest Research Institute, BAS. "Difference Between Amino Acids and BCAA ." DifferenceBetween.net. March 5, 2019 < http://www.differencebetween.net/science/health/difference-between-amino-acids-and-bcaa/ >. McKee, T., J. McKee. Biochemistry: The Molecular Basis of Life 6th Edition. Oxford: Oxford University Press. 2015. Print. Moore, J., R. Langley. Biochemistry for Dummies 2nd Edition. Hoboken: Wiley Publishing Inc. Print. Wu, G. Amino Acids: Biochemistry and Nutrition 1st Edition. Boca Raton: CRC Press. 2013. Print.